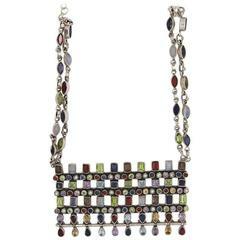 Hand made, one of a kind art to wear necklace created by New York City artist and jeweler Enid Kaplan. 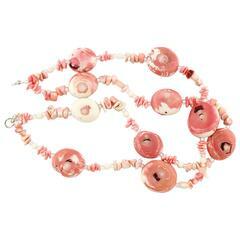 Necklace is entitled "Con Esperanzas y Rosas" or "With Hope and Roses". It is made up of sterling silver, steel, glass roses, paint and photo collage on wood. 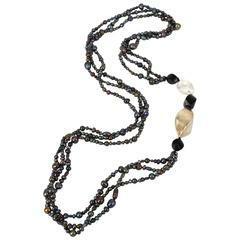 Center piece measures 4" by 6" by 1/2", while the overall measurement of the necklace is 15" in length by 8" wide. Signed Enid Kaplan, 1997. In very good, unworn condition. From the estate of the artist, Enid Kaplan. Enid Kaplan was a New York City studio jeweler, sculptor and mixed-media artist who taught, lectured and exhibited all over the world. Her work, ranging in scale from 1 inch to 20 feet, has been widely published in books and magazines, and is part of several international permanent collections, including that of the Museum of Arts and Design in New York. 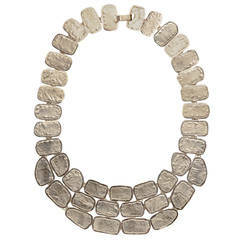 After graduating from the Rhode Island School of Design in 1975, she briefly went to work as a production jeweler in New York's jewelry district and set up her studio, from which she began to work and teach. In 1978 she won the DeBeer’s “Diamonds Tomorrow Design International Competition”, bringing her a profile in American Craft Magazine and her first featured show at the prestigious Aaron Faber Gallery in Manhattan. A self-described colorist, she was a pioneer in the use of reactive metals, and the nuance and expressiveness she could coax out of titanium and niobium remains unmatched to this day. She was soon exhibiting in museums and galleries all over the world while maintaining a vigorous teaching schedule at the 92nd Street “Y”, Parsons School of Design, New York University, Fashion Institute of Technology, Penland, Arrowmont and Brookfield. During frequent and extended backpacking trips with her husband through remote regions of Central and South America, East Africa and Southeast Asia, Enid began to absorb the significance of the shamans - the tribal storytellers and ritual-object makers to whom she felt drawn. They reconnected her to the communal and spiritual responsibilities that artists had traditionally undertaken, and upon her return, she began creating her jewelry as amulets, as tools for rites of passage, for healing, for making the invisible world visible. In very good, unworn condition.